Dinosaur might have left the planet for a quite a long ago, but their miniature modules are capable of leaving you awestruck and horrified till no. All this has been achieved, with the invasion of latest robotic technology; lifelike models of dinosaurs are created. Keeping this in mind, we have launched Dino Park Theme, which is actually an artificial jungle full of dinosaur models with light sound effects. Also, the place will be equipped with highly sensitive sensors to react on teasing them or even a presence of a person. The Area required for its construction is in between the range of 800 and 1000 Sq. ft. (carpet). 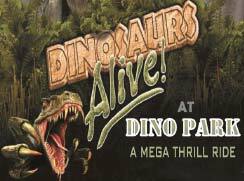 For Dinosaur Park services in Lucknow, contact us now.